This recording follows a course originally plotted by the Biola University Chorale, Loren Wiebe, director, on a series of Alliance Music Publications also entitled Songs for the Journey. Although steps have been retraced, the landscape along the way has been transformed. The choral presentation has given way to a vocal solo voyage for Gerard Sundberg, navigated by the compositions and arrangements of Edwin T. Childs, accompanied by the masterful styling of pianist William C. Billingham. Various solo and descant instruments join in the travels. It is a musical trek through spiritual terrain, and the musicians hope that every note and every word brings your heart one step closer to our landmark, our guide, our Savior, Jesus Christ. 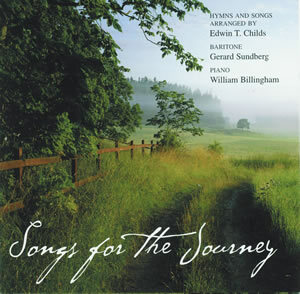 You may purchase “Songs for the Journey” from the composer. It is no longer available from College Church in Wheaton, Illinois. You can also buy sheet music for this recording.